Ok, time for the experts to answer. . . . . . I know 64bit increases the addressable memory by, mmm, oooh, well let's say quite a bit. 32bit can only address 3 Gb or so without some switching so why would a 64 bit client be needed? Are they intending to increase the size of the client???? 64 bit would allow them to load more content into RAM rather than swapping things in and out to disk so much. It's not really 64 bit either. We technically don't use 64 bit processors unless you have an Itanium which has 64 data lines. 64 bit we use has some internal 64 bit registers but still doesn't even address the full amount of memory 64 bit gives you but it is substantially more than 32. Going to have to go with what I thought when O:MFG rolled out "You should have done this from the bloody start!". Good to see that they are going to further optimize the engine for modern hardware. Seeing the reqs for EverQuest Later Dude and it only makes sense to go all out for optimization. yes i want. 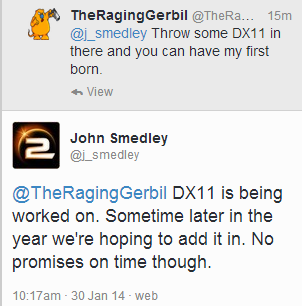 DX11 and moar frames here i come. He may cut you some slack, since you have chosen the correct faction (NC, of course). Smed is not a coder. He's not a program manager, and he's not even a lowly tech pubs guy. He's just a suit. And I wish he'd shut up. Pass the shaker of salt, please. And Cycles...? Press on. We're all depending on you. so? he's also a suit who also knows what the hell goes on at the PS2 dev team. In defense of Smed, I have my problems with SOE, but he seems like one of the few gaming execs that is properly transparent and actually gives a damn about what the fans say. I don't always agree with his decisions, but I give him some credit non-the-less. There happens to be an entire faction who fights and dies for the Suits. And bonus checks. You watch your mouth, kid.